I was reading my Bible yesterday while at a little mini-writer’s getaway and came across this verse. It’s always been one of my favorite verses, but the thing that hit me THIS time was the “I” after surely. 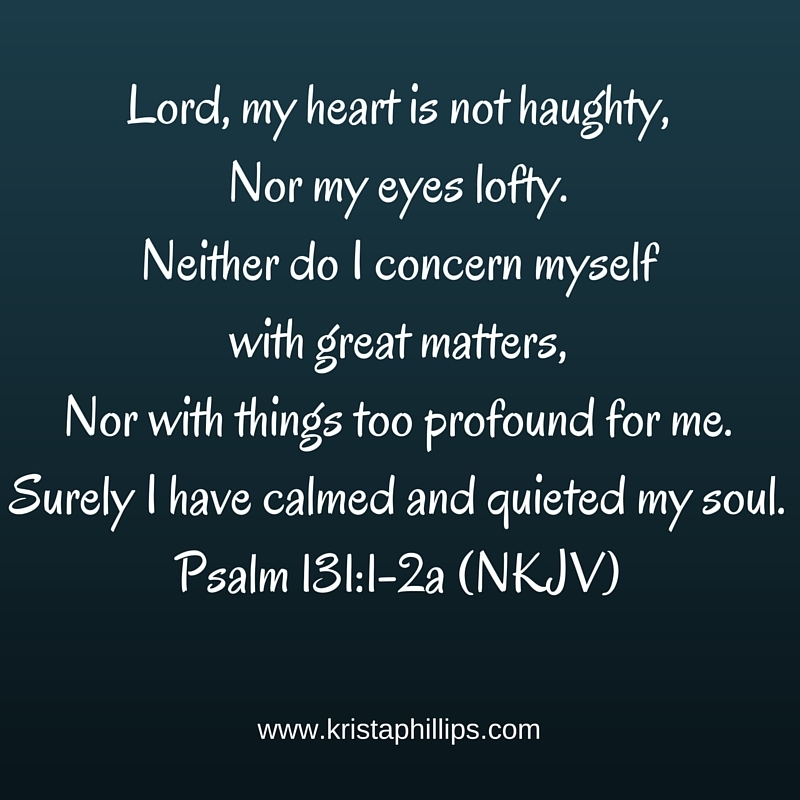 I’ve always taken this verse as “God” having calmed and quieted my soul. But having gone away for the weekend after a particularly difficult week, when my soul was in desperate need of having a little calm and quiet, it struck me that this is OUR responsibility to a point. That there are things we can do to calm and quiet our souls. Like honoring the day of rest. Like taking moments to step away and focus on God. Like laying our burdens at God’s feet and resting in him. Sometimes I feel a wee bit of mom guilt when I go away for these weekends a few times a year. But I’ll be honest with you. My soul NEEDS them. It isn’t a “fun” weekend or a vacation — it is time to relax and let stories pour out of me at will. I am honestly a better momma after taking the time to do so. It was so nice to have God confirm that this weekend!